Chris White: storm chasing C.V.
~ Yes, there are severe storms in the Old Dominion! Seven years ago today a tornado outbreak blasted through North Carolina, an event which I’d planned on chasing but was thwarted. So while I ponder the “what might have beens” for that day I am writing up yesterday’s chase here in Virginia. I picked up my chase partner at 1:00 pm and moseyed south to Martinsville. I was in hopes of discrete cells going up east of a squall line that was barging ahead of the surface cold front approaching from the west. We kept our eyes on cells moving almost due north out of North Carolina, finally choosing one complex to intercept. Scud was gathering under the rain free base at the southwestern edge so we were in hopes of this storm organizing and intensifying. But soon after this photo we had to move north in a somewhat vain attempt to stay out of the obscuring heavy rain. Storm motions all day were on the order of 50 mph so gaining and maintaining position was difficult at best. However this feature didn’t last long. The entire complex surged ahead of us as we strove to keep up by turning north at Callands and crossing the ridge line. We finally admitted defeat when we reached VA Route 40 at Penhook, where we diverted west to catch our breath and regain situational awareness during a comfort stop at Glade Hill. We scooted north and a bit west via US Route 220 to check out the western edge of this complex but its forward speed surrounded us with blinding rain before we could reach Wirtz. Pausing there to let this mess clear out to the north it became obvious that while shear was plentiful instability was too weak to enable this convection ahead of the squall line to intensify. At this point we hadn’t seen any lightning nor heard any thunder. I had switched on the livestream while rolling down Rte 29 so the local TV station had access to our view. The tornadic circulation was just west of Danville VA at this point and roughly 12 miles southwest of our position. The rain-wrapped nature of the mesocyclone was obvious here but I hoped we could see a few details before we had to bug out northward. We fled via Rte 29 to an exit north of Chatham where we turned onto a county road that paralleled the storm a few miles to the east of its path. Even though we passed several west-looking vantage points all we saw was heavy rain. Crossing VA Route 40 east of Gretna just as the circulation center passed directly over the town we continued north, turning onto Telegraph Road by which we hoped to maintain position on the cell as we desperately sought more open vantage points looking west. (The vertical black line is the chasemobile’s antenna. Since it was raining steadily I was leaning out the window with this in my field of view.) My guess is that this happened not long before we arrived at this point, perhaps from the rear flank downdraft (RFD) sweeping through this area just east of the mesocyclone. Although we didn’t want to admit defeat at this point the resulting U-turn meant we were now far behind the rapidly translating circulation. We maneuvered our way back to Rte 29 and zoomed north but the chase was basically over at this point. The storm intensified again near Lynchburg with an awesome couplet showing up on the radar velocity scan. That signature corresponded with the tornado that caused quite a bit of damage just west of Lynchburg. Even though we didn’t see any particularly interesting storm structure or details this was a successful chase. As I’d hoped we intercepted two discrete systems ahead of the line but they didn’t strengthen like I thought they might. Then, also as I’d hoped, we doubled back and re-engaged the chase with a (tornadic) cell on the leading edge of the squall line. We just couldn’t see anything given the rain-wrapped nature of things yesterday. And we did provide livestream footage for the local TV station’s use during their tornado coverage. That counts a lot in my book even though we didn’t actually see the tornado. Day 14 of “Sixteen Days of Virginia Storm Chasing”: As mentioned in previous posts tropical remnants sometimes provide very productive chase opportunities. The June 20th 2015 passage of Bill’s remnants through Virginia proved to be one such instance. “I had a feeling the tropical remnants of Bill would provide a productive Virginia convective setup. As such I cleared the decks and dedicated the entire afternoon and evening to giving chase. After poring thru the data and models I decided to start out in the Blairs area close to 3 pm even tho’ the primary feeder band wasn’t due out that way until later. I live-streamed for a while from this location before noticing two more storms approaching from the south. The cell in the foreground exhibited a funnel-like lowering that caught my eye (left side of photo) while the storm in the background also looked very impressive both on radar and visually. The close approach of the nearer storm with scud rising into its base convinced me to retreat northward. Thus I pulled up stakes and headed up Rte 29 to Gretna where I watched that cell pass over the town a half mile to my east containing another lowering as I continued to live-stream. As this storm passed by I kept one eye on the next storm which was heading directly toward me with a wall cloud underneath it. When this cell neared I decided conducting a “static core punch” under a storm with an active wall cloud wasn’t a good idea. I expeditiously leapfrogged west in a futile attempt to miss the growing precipitation shaft. Fortunately there either wasn’t any hail. However I certainly didn’t miss out on the heavy rain which quickly erased my situational awareness. After the rain eased I motored back east toward Gretna to regain perspective. The storms I’d been watching had escaped to the northeast with all recognizable features now rain-wrapped. However the main feeder band, lined up NE/SW, was now approaching the U.S. Route 29 corridor. Thus I dove south on Rte 29 to go take a peek. I couldn’t see any definable rotation but it was obvious this shelf cloud / squall line meant business, likely with damaging winds. Maneuvering desperately along back roads I finally wound my way north to Virginia Route 57 just outside Chatham and drove east as fast as I could legally go. Not only was I was racing away from the squall line I was also searching for a safe vantage point. I needed to live stream and conduct a phoner with the local TV station at the top of their six o’clock broadcast. Three miles east of town this tree completely blocked Rte 57, apparently felled by one of the previous storms that had rolled across the area. As blue lights flashed on the other side of the tree I had very little time before the squall line caught up with me. I suddenly remembered a side road I had just passed that ran along the edge of an open field so I quickly did a U-turn in the middle of the empty highway. After switching on the live stream I dialed the TV station and conducted the phoner without difficulty. Right after I hung up with them the rain – but no hail! – began pounding down. Once the precipitation let up I cautiously reentered Rte 57 and headed back west to Rte 29 where I rolled southward once again. I followed this cell for a bit before getting swallowed by more heavy rain and decided that I’d had enough chasing for one day. Heading back north to Gretna I kept my fingers crossed that municipality still had power. It did, so I grabbed a very late dinner and visited with my son and daughter-in-law who dropped in to chat. #vawx Whence goeth the June storms? ≈ Comments Off on #vawx Whence goeth the June storms? The storm action has come to a screeching halt here in early June during a typically very active part of the chase season. An upper level trough early this week did fire a bit of convection but I was otherwise occupied and couldn’t chase. The now building East Coast ridge and accompanying Bermuda High are combining to squash any decent convective chances for the next several days. There are hints of some increased activity next week but the GFS provides little hope of shear so these would likely be air mass thunderstorms more typical of July and August than early to mid-June. Still, these type storms can provide some fun chasing with a variety of shelf clouds and perhaps a brief wall cloud or two accompanied by hail and strong winds. Meanwhile this photo is still one of my favorites from northern Virginia chasing. I was fleeing eastward in southeastern Fauquier county just ahead of a wall of rain pouring out of this April 3 2006 squall line. I stopped long enough to snap a couple of photos with the rain shaft literally pounding down a couple hundred yards behind me. I had planned to trek to Buckingham county this afternoon based on model indications that a prefrontal trough would fire storms near I-64 that would then sag south and east. Instead I wound up cutting short morning errands and rushing out the door at 11 am to pick up my chase partner to zoom toward Rocky Mount. An overnight MCS muddied the convective waters – so to speak – and kept storms going into Friday morning across eastern KY and southern WV. During a mid-morning walk I noticed a very robust cell south of the Roanoke valley that must have fired along an outflow boundary from the MCS. Upon checking radar I realized this cell had all the CAPE that existed east of the Blue Ridge mountains to itself. Thus I hurried home, gathered the chase gear, and rolled down the driveway. After picking up my partner we drove south on US Rte 220 and saw this cell pounding Rocky Mount with large radar-indicated hail. We stopped along 220 to let the core drift east across the highway and then pushed south of town before turning east on a rural route. We maneuvered our way to VA Route 40 at Glade Hill where we then hit the gas toward Gretna to get ahead of the developing convective complex. Arriving at the US Route 29 corridor I realized we couldn’t zoom north as the cell had already enveloped the highway in that direction. So we continued east of Gretna on Rte 40 before pushing north on a county route. We bobbed and weaved along rural lanes with brief glimpses of a possible wall cloud under the original storm base. We zoomed toward a known vantage point near Long Island VA but were abruptly halted by a “Highway Closed Ahead” sign (bridge construction). In a highly frustrated state of mind I navigated us south and east via more rural roads back to Rte 40 near Brookneal but the damage had been done to our timetable. The storm hit the town while we were filling the chasemobile’s gas tank (didn’t get that done earlier due to the early departure from home). We did continue east of Brookneal a bit but realized we’d lost position on this cell and likely couldn’t regain it given the lack of available routes east. Still shaking our heads at being thwarted by the road blockage we reversed course back west toward Gretna as more storms crossed the mountains. Along the way we witnessed a mammatus field on the backside of this first storm. We had enough time to eat a late lunch in Gretna while I kept an eye on radar. When we left there we pushed a few miles north of town to watch another storm approach. One cell tried to form a wall cloud but it didn’t hold together long. Noticing that things looked more vigorous further south we made our way back to Rte 29 and dropped down to a vantage point midway between Gretna and Chatham. Here we watched as another storm developed a lowering to our southwest. This looked like a nascent wall cloud but the storm soon gusted out and this morphed into a shelf cloud. We let this cell go by and rolled further south near Tightsqueeze to check out even more convection. While there the storm we had just abandoned intensified and garnered a severe TS warning so guess what we did? Yep, we reversed course using a rural route to cross the White Oak Mountain ridgeline in hopes of keeping up with this storm. We made our way to VA Route 57 and turned east to maintain position just south of it. At one vantage point just off 57 we had this view of the storm to our northeast as thunder rumbled continuously. Not far east of here we had to drop south of the highway since the storm was crossing it. We wound up driving all the way south to VA Route 360 where we continued east toward Halifax. Again we glimpsed what could have been a wall cloud underneath the base but never could find a decent vantage point from which to stop and see it. Finally we reached the rural areas just west of the town of Halifax where we could see a tremendous hail shaft on the back side of this cell. With a growing squall line – all under a severe TS warning – now east of us and no clear vantage points we threw in the towel and called it a chase. Overall it was an enjoyable and productive chase but the 2017 frustration at not finding decent vantage points continued. That luck will change as the season progresses. High shear values and abundant surface moisture (DP’s>65 in many places) coupled with upper level support and an approaching cold front all served to set the stage. But the threat in Virginia didn’t materialize and by the 20Z SPC update we were back in a Slight Risk with the Enhanced portion withdrawn mostly north of the Mason-Dixon line. But that didn’t deter me a bit. I headed out just after lunchtime to get east of the Blue Ridge amid gusty southwesterly surface winds, low ceilings, and intermittent heavy drizzle. This was all shown on most of the short-range models and was a concern for limited instability. Given the setup with bulk shear vectors parallel to storm motion it was apparent that a squall line was in order later that afternoon. But…if a discrete cell could go up ahead of the line rotation was almost guaranteed. That last consideration drove most of my thinking as I pushed east to the U.S. Route 29 corridor at Gretna. I sat there a while watching radar and finally decided to give chase to a small but relatively organized cell rapidly steaming northeast toward Brookneal. Pushing hard to catch up with it along VA Route 40 I could see an updraft and a rain-free base but that was about it. I turned left to follow the storm via a northeast leading county route. However in my attempt to keep up with this rapidly moving storm – and chasing solo – I made a wrong tactical navigation decision when I reached VA Route 57. In my (incorrect) estimation the storm was going to overtake my current route before I could get in front of it. Therefore I diverted onto Rte 57 to push a few miles east and then use rural roads to get back in front of it. That was a wrong move that I may have avoided if I’d had a chase partner with me instead of doing everything myself. When that plan backfired I wound up completely out of position on this monster cell, exacerbated by a wrong turn that cost me several minutes. Zooming along country roads never brought me close enough to see a lot of detail and I wound up on the VA Route 40 corridor near the hamlet of Cody. What to do next? Widening out the radar view I noticed the aforementioned squall line had taken shape and was approaching the Rte 29 corridor. What was even more interesting was that a section of the line nearing the Danville VA vicinity was now tornado-warned. It took about 20 seconds to decide I needed to drop south so I swapped directions, heading down the Cody Road to U.S. Route 501 and then rolling toward Halifax. In Halifax I turned west on VA Route 360 to maneuver into a vantage point from which to watch the oncoming convection. By this time the tornado warning had been dropped but there was still rotation indicated on that part of the line. (Most of the line itself was still severe-warned.) I continued west on 360 for a bit and then pushed a couple miles south at Vernon Hill. Finding an open vantage point I settled in to watch the line approach. At this juncture I couldn’t see any way to avoid the squall line so after checking the VIL parameter for hail potential (none was evident) I decided to conduct a “static core punch”. After some sheets of rain, a gust or two that may have topped 30 mph, and no hail I was on the west side of the line. So May Day wasn’t convectively ballistic but it was a nice chase day! The 2 and 5% tornado probability contours were close enough to entice me to keep track of the action and have my gear ready to go at short notice. Of course with forecast storm motions in the 50 knot range it would have been stop and watch as the cells flew by. The approaching upper level trough and accompanying short waves / jet streaks combined to fire up thunderstorms across the western part of Virginia during the wee hours Thursday morning. I awoke at 2 a.m. to a couple of loud peals of thunder and heavy rain but after checking radar I wasn’t even tempted to step outside for a peek. Around 8 o’clock I moseyed to a local vantage point to check out a couple of cells that actually heralded the passage of the surface cold front. One developing complex just north of me looked interesting with hail indicated on radar but it was flying northward at a brisk pace. I chose to stay put and never saw anything else worth even photographing. 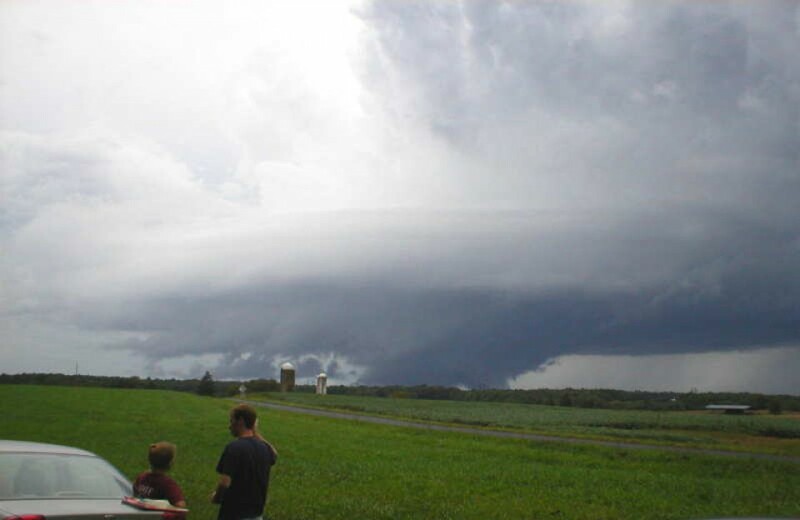 Meanwhile two separate regions of Virginia experienced severe weather as it developed later in the day. Both the Tidewater area east of I-95 and sections of Virginia north of I-64 bore the brunt of straight-line winds and several brief tornadoes. Tree and structure damage occurred across a wide swath in both areas as a strong squall line (QLCS) marched through. Yes, that’s crass, borderline vulgar, and its use hints at a narrow vocabulary. But “sucked” characterizes today’s chase perfectly. The threat was upped from a Day 2 Slight Risk to an Enhanced Risk for a good chunk of Virginia. Adding fuel to the fire was a Severe Thunderstorm watch issued for much of western VA just after 10:30 am followed closely by multiple Severe TS warnings in my chase area. After perusing the short term models this morning I determined my initial chase target to be Bedford. A squall line was to blast across the mountains and enter the Piedmont during the early afternoon, possibly firing discrete cells out ahead of it that would take advantage of a juicy environment to rapidly intensify. Knowing full well that storm motions near 60 mph meant I needed to get out early I planned to leave home at noon. However after watching the radar for a while the storms seemed to be ahead of schedule, the first indication of a potential problem with the morning model solutions. Thus I departed a little after 11:30 and based on the storm motions and timing that should have given me 30-45 minutes of lead time once I got to Bedford. Alas, that was a pipe dream. The squall line was perhaps 10 minutes behind me when I arrived in Bedford. Given a stop for gas and a potty break much of that 10 minutes was squandered. The next couple of hours involved rapid decision making and maneuvering across rural Bedford county with the rain and wind nipping at my heels. I did stop – very briefly – in a western section of the county to snap a few photos and live stream for literally a couple of minutes as the line approached. When it inevitably drew too close I retreated south and east to Altavista where I picked up U.S. Route 29 and dove south to Gretna. There I stopped just as the line arrived with a burst of wind, a spit of rain, and then…nothing. No mesocyclones, no hail, no wall clouds, and not even any lightning. Thus I glumly sat in Gretna for quite a while watching radar as the line petered out and overcast cold clouds blocked the sun. Another stormchaser – Alex Thornton – joined me there for a bit and we monitored radar as a broad area of rain built over far southwest Virginia. This, too, hadn’t shown on the model solutions I remembered perusing. Chastened, I rolled west toward Rocky Mount only to hear to my utter disbelief that another Severe Thunderstorm Watch had been issued that included Pittsylvania and Halifax counties. Those counties had been capped previously and were now under dense cloud cover with dewpoints in the mid-40s. I didn’t buy into that Watch and therefore ignored it, heading back home to ponder if the White family Moderate Risk curse had been extended to Enhanced Risks. A very disappointing “chase” if I say so myself. Haven’t totally ruled out a chase on Friday 10/21 but the setup isn’t looking good. The GFS and Euro have a strong surface front plowing across Virginia early Friday, too early and with too much cloud cover for decent instability. The 12Z NAM is holding out for a weak surface low to form along the boundary and slow it down by 3 or so hours compared to the other models. Per a late Friday morning forecast sounding along the U.S. 29 corridor that may allow CAPE to boost to nearly 1000 j/kg. Even if the NAM is correct – it was the better model during the Feb 24th deep trough setup (which created a tornado outbreak) – this would be another high shear / low CAPE situation. Those are always dicey prospects for chasing around here especially with low LCL’s making visibility difficult. On top of that this looks and feels like a squall line event vs. discrete cells. I’ll keep an eye on it but I’m not particularly hopeful at this point. Although a strong cold front promised relief from the Mid-Atlantic heat and humidity it didn’t bring much shear with it. Thus today’s chase was yet another “shelfie-fest”with a squall line providing the outflow. Heading out just after 1 pm today I rolled to Rocky Mount to refuel the chasemobile and choose whether to continue south on U.S. 220 or go east on VA Route 40. After reviewing radar I chose the latter as a squall line was taking on the typical southwest – northeast orientation associated with a cold front passage. This time tho’ I didn’t stop in Glade Hill but maneuvered south and west from there to a Franklin county hilltop. I wound up heading south on Virginia Route 41 toward Danville and then diverting east to U.S. 29 near Blairs. At this point the leading edge of the northern section of the line was east of Rte 29 while the southern section was dissipating. I did drop all the way south to U.S. 58 in Danville where I paused to grab a snack and evaluate the situation. With little hope of anything more interesting to see (retreating in front of shelf clouds gets old after a couple hours) I called off the chase and headed home. It was an enjoyable and relaxing chase but I’m itching for something more. Unfortunately without tropical help this time of year doesn’t hold much more potential. I haven’t chased in a week and it’s not because there haven’t been any storms. Instead when there have been storms worth chasing I’ve had other commitments, and when I’ve had time to chase the storms have been heavy rainers that I didn’t feel like going after. In fact this summer has been rather wet compared to normal. The chasing drought can be laid at the feet of the jet stream’s northward retreat. Upper level winds over Virginia are very weak in early August meaning little or no available shear. Convection thus becomes a case of “what goes up must come down” as the vertical rain shaft cancels out the updraft. While that can create some pretty unique outflow boundaries and cool shelf clouds it also makes chasing a “dodge ’em” activity. Chasing (or being chased by) squall lines and multicell complexes becomes tiresome and a bit humdrum after a while, especially when every severe thunderstorm warning contains the phrase “60 mph wind gusts” and nothing else. From now through early fall what little hope arises for longer lasting discrete storms typically comes from tropical remnants. The lower atmosphere helicity (spin) these systems bring with them have contributed to some exciting chases in past years. Thus I have my eye on the tropics and am paying as much attention to National Hurricane Center forecasts as I am Storm Prediction Center outlooks. So far there’s little on the horizon to generate hope but one never knows. Of course as the jet stream begins to sag southward again I’ll also be watching troughs as they approach the Mid-Atlantic. A strong cold front with some decent wind shear thrown in can still work chasing wonders this time of year. I’ve been known to chase all the way up to Veterans Day given the right setup.